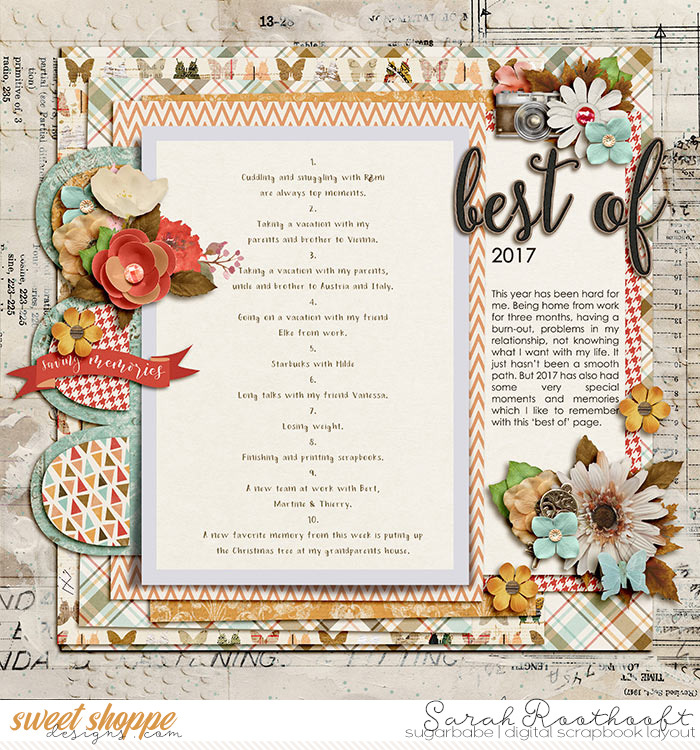 Layout made for SSD December Bingo Challenge #8 - Top 10 Favorite 2017 moments. This is stunning! I'm so sorry it's been a rough year for you! So glad you get to end it in a positive happy note of becoming a SugarBabe! Yay! I love this!! I love how the journaling looks like a menu or something that you scanned in for this layout. I'm sorry 2017 wasn't the greatest, but so glad you were able to focus on the positives of this year!! Beautifully scrapped! Beautiful page! I love how you used the photo mat as a journal area for you layout. Love the papers and the clusters! This page is stunning as you add journaling in the 2 part and I admire the way you show it (sorry for my English but I hope you'll see what I mean). I'm so sorry for your difficulties during this year... I'm happy you finish this year with good things and that you're going on optimistical way, I wish you all the best!!!!!! !